President Obama got burned by UB last year when he picked them to upset West Virginia in his annual March Madness bracket with ESPN. Obama’s not letting that happen again. In his 2016 bracket, revealed Wednesday, the president picked Miami to beat UB and Arizona before falling to Villanova in the Sweet 16. His national champion is Kansas. UB, seeded 14th, is being picked to beat Miami in only 7.7 percent of ESPN.com brackets. Vegas Insider lists the Bulls as 14-point underdogs. Here’s Obama’s full bracket. It’s worth noting that his picks last year only finished in the 40th percentile of all ESPN.com brackets. Obama has filled out a presidential bracket every year since 2009, correctly picking the national champion once in his first year (North Carolina). Canisius and Niagara have met in the playoffs plenty of times, but never quite like this. The Western New York rivals’ three most prominent sports teams – men’s basketball, women’s basketball and ice hockey – will all face each other in the first round of their respective conference tournaments this week. Never before have all three teams met in the playoffs in the same year, let alone in the same round or weekend. 2011 was the only year Canisius and Niagara met in the postseason in two of the three sports, with Canisius women’s basketball beating Niagara in the play-in round and the Griffs hockey team winning in the semifinals. The chart below shows the history of their postseason meetings. The teams are 3-3 in men’s basketball while Niagara has never beaten Canisius in a postseason women’s basketball or hockey game. The Canisius-Niagara women’s basketball game kicks off the entire MAAC Tournament weekend, starting things bright and early Thursday morning with a 9:30 a.m. contest at Albany’s Times Union Center. 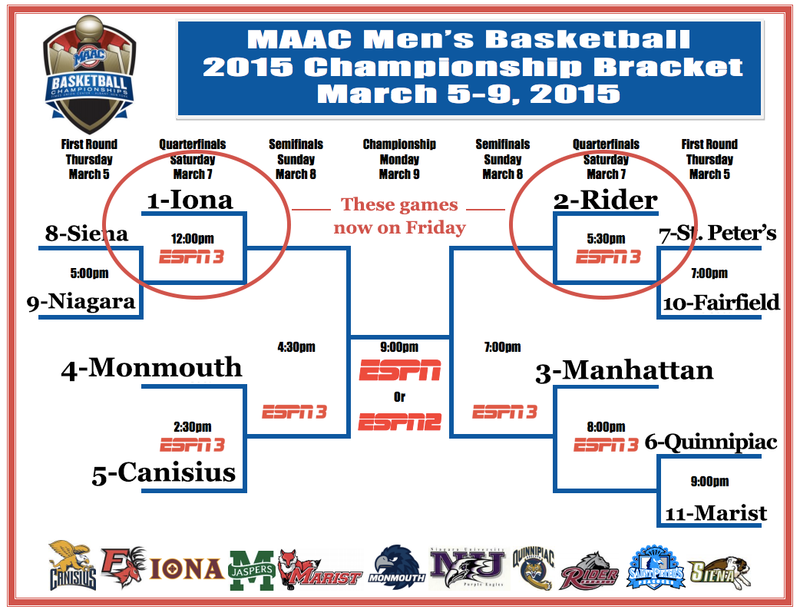 Canisius (8-12) is seeded eighth and Niagara (5-15) is seeded ninth. Canisius swept the regular-season meetings, winning the road game in overtime. The winner plays No. 1 Quinnipiac at noon Friday. The men’s basketball teams meet in the play-in round at 7 p.m. Thursday night. Seventh-seeded Canisius (also 8-12) swept both games from Niagara (also 5-15) this year. The winner faces No. 2 Iona at 9:30 p.m. Friday. The hockey teams play a best-of-three series this Friday-Sunday. No. 7 Canisius (10-13-5) is the higher seed, so it will host all three games at HarborCenter, with faceoff at 7:35 p.m. Friday and Saturday and 5:05 p.m. Sunday if necessary. Canisius took the season series from Niagara (5-18-6, seeded 10th) with a win and a tie. Both games were at HarborCenter. Atlantic Hockey reseeds teams after the first round, so the next opponent is not yet known. It will either be 1-Robert Morris, 2-Air Force or 3-Holy Cross. Canisius has already clinched the Battle of the Bridge – the all-sport competition between Canisius and Niagara – for the sixth year in a row. Only regular-season games are included in the competition. The seedings for the 2016 MAAC Tournament were finalized Sunday night. All games are at the Times Union Center in Albany, N.Y. The men’s and women’s MAAC basketball tournaments will feature a slightly different format in 2016, giving the top two seeds an added day of rest between the quarterfinal and semifinal rounds. The quarterfinals will now open Friday for teams seeded first and second, which gives them Saturday off before the semifinals on Sunday, assuming they win. Teams seeded third and fourth have Friday off but will have to win Saturday and Sunday to advance to Monday’s final. Iona has had the MAAC’s top seed locked up for a while now, but it took until the final day of regular season play for the rest of the bracket to shape up. Manhattan beat Canisius on Sunday and Quinnipiac lost to Marist, setting the Jaspers up the 2-seed and dropping the Griffs to fourth. Marist, Saint Peter’s and Rider all tied at 9-11 but Marist won the tiebreaker for the 6-seed while Rider fell all the way back to eighth.